I'm starting to wonder if I'm running out of "juice" for this blog. I'm a pretty low maintenance bride-to-be. I could come up with a million things to do, becuase there are plenty of bandwagons to jump on in the wedding planning world. But I don't feel compelled to do most things. I went out today just to browse around Dollar Tree and found something I knew could be a bonafide DIY project. As a matter of fact, there were soooo many things there that could be utilized for a wedding. To be honest, I think I grabbed these up just so I could show something to my blog readers, lol. So. 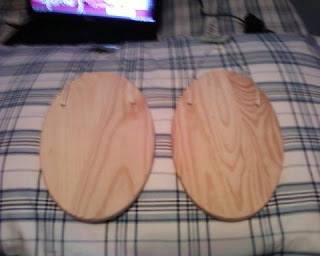 I bought these hanging plaques. I bought two each of the oval and heart shaped ones. I'm sorry about the picture quality-I can't find my camera and had to use the one on my cell phone. And it's so hard finding a decent backround at home so say hello to my plaid bed sheets, lol. I'm thinking of painting a silhoutte of myself and my groom on each of the oval shaped plaques to hang outside of our respective dressing rooms. 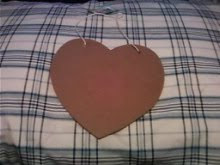 The hearts will be hung on each of our chairs at our table at the reception and say "bride" and "groom." I'll try to find some inspiration photos of this to give you an idea. that's a cute idea! maybe you should write other blog entries. other comments you want to make about weddings, marriage or life in general? I'm sure your readers would love that!